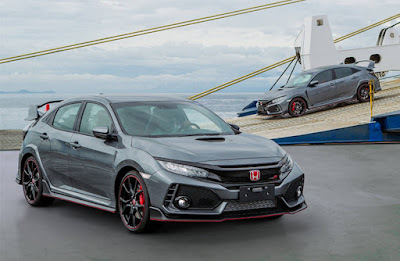 Honda Cars Philippines, Inc. announces that a second batch of the Civic Type R has finally arrived here in the country. Customers can visit any of the 38 Honda Car Dealerships nationwide starting September 1, 2018 to see the iconic Japanese hot hatch. Initial customer deliveries will commence in the first week of October 2018 at a suggested retail price of P 2,980,000. With its highly anticipated arrival in the Philippines last 2017, the Civic Type R is the first Type R model sold locally with one hundred (100) units made available for the Philippine Market, all of which have been booked within 48 hours upon the announcement of its availability. With the astounding market acceptance and continuous demand for the Civic Type R, Honda has decided to bring in another batch of one hundred (100) units this 2018. Together with the signature Championship White and Rallye Red color lineup, the Polished Metal Metallic color will also be available. Thanks to its 2.0-liter VTEC Turbo Engine packing a maximum power output of 310 horsepower and peak torque of 400 Nm, 6-speed manual transmission, bespoke chassis set-up and its advanced aerodynamics and technology features, the New Civic Type R aims to deliver an exhilarating driving experience both on the track and on the road with its legendary performance attributes. Having the highest distinction for performance for the Civic model line-up, the New Civic Type R proved its capabilities as it broke several track records in some of the world’s most challenging racetracks such as the Spa-Francochamps in Belgium, Silverstone in the UK, Estoril in Portugal and Nurburgring in Germany making the New Civic Type R the fastest front wheel drive production vehicle to date. Keep it coming Honda. Wooohoooo!